Bowling party games are a fun way to unwind with friends, family or coworkers. You can play games that are silly or games that challenge you to improve your bowling skills. The important thing is that everyone has a good time playing and a chance to socialize in a relaxed setting. Pretend you're the Babe Ruth of bowling and call your roll before you make it. You can predict whether you will knock down an even or odd number of pins with your roll, or even predict a strike. This is a fun, lighthearted game for friends who want to take the competitive edge off bowling. 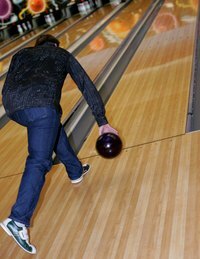 Bowling in slow motion is an opportunity for everyone to look as silly as possible while making their way down the lane and releasing the ball. While you won't bowl your best game this way, you and your friends will have a lot of laughs. A popular bowling game where you and a teammate switch on and off frames for the duration of a game. This is an ideal bowling game for larger parties and teammates should be paired up carefully. Experienced bowlers should be paired with novices, which will add to the fun when one player rolls a strike or spare because her teammate must then try to keep up the momentum. This is also a good mixer opportunity to pair singles together, as bowling allows plenty of opportunities for small talk and lighthearted fun. If you're right-handed, bowl with your left; if you're left-handed, bowl with your right. This is an ideal game for players who want to challenge themselves to bowl as well as possible while handicapped. You can make the game even more challenging by also requiring players to bowl with their eyes closed.